So, just a few things to remind people I am, in fact, alive. Alive, but fighting the unfolding of the Universe for every scrap of free time I can get. Let me tell you, the Universe is winning. However, I do take small pleasures where I can. The above was snapped during one of our walks. It’s the seed ball of a Salsify plant, photographed with my phone, and processed through SnapSeed. 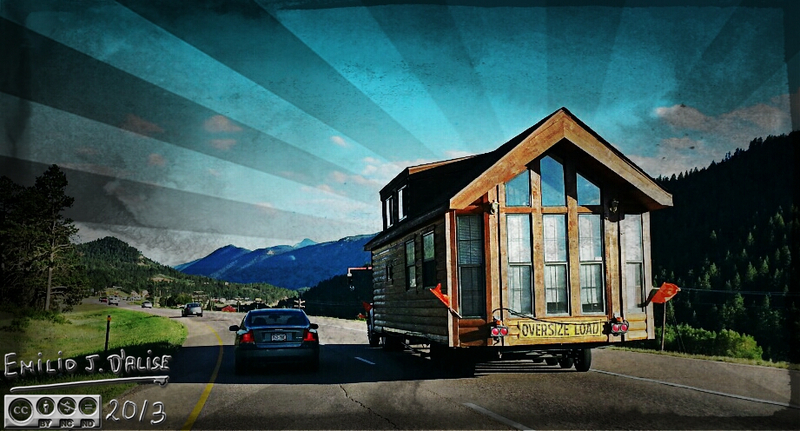 I also take pleasure in the chance encounters . . .
. . . such as seeing a house driving down the road. It too got the same treatment as the Salsify seed ball, plus it was Pixlr-o-maticated . . . Finally, yesterday evening I spent some time among the hummingbirds on my deck, and together we watched a sky that, while not amazing, certainly entertained. By the way, you can click on these to view the full size photos. These are all panoramas from the phone. Those are in the span of about 10 minutes. As I said, the sky might not have looked like much, but I saw it like this . . .
Well, that’s it . . . my lunch is over, and I must cease all enjoyment in life, and get back to work. However, I do hope I brought at least a tad of enjoyment in your life. Thanks for visiting. This entry was posted in Effects and Filters, Photography Stuff and tagged phone camera, Photography, Samsung Note II, smart phone, SnapSeed App. Bookmark the permalink. You take full advantage of opportunities, indeed. I’m not allowed to photograph and drive at the same time. But I like it when others do. It’s called efficient time management. Plus, I like living on the edge . . . With a phone camera. Thanks, John. Those plants are impressive all on their own, so they make for easy subjects. LOVE the sky photo. I imagine it as a painting on a wall. Thank you, and yes, it does look like it could be a nice wall covering. Great photos make for a great post! Excellent Salsify shot but the Starlit Sunset is AWESOME! I can really see a copy of it hanging on the wall above my desk . . .